: Vehicle modifications involving braking system, aftermarket roof racks, suspension, steering system, tire construction and wheel or tire size may change the handling characteristics of your vehicle and may adversely affect the performance of the AdvanceTrac® system. In addition, installing any stereo loudspeakers may interfere with and adversely affect the AdvanceTrac® system. Install any aftermarket stereo loudspeaker as far as possible from the front center console, the tunnel, and the front seats in order to minimize the risk of interfering with the AdvanceTrac® sensors. Reducing the effectiveness of the AdvanceTrac® system could lead to an increased risk of loss of vehicle control, vehicle rollover, personal injury and death. : Remember that even advanced technology cannot defy the laws of physics. It is always possible to lose control of a vehicle due to inappropriate driver input for the conditions. Aggressive driving on any road condition can cause you to lose control of your vehicle increasing the risk of personal injury or property damage. 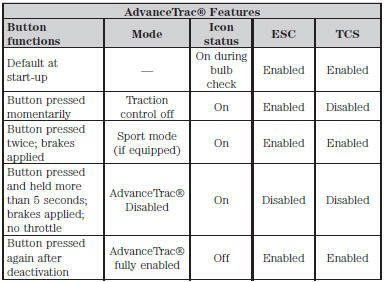 Activation of the AdvanceTrac® system is an indication that at least some of the tires have exceeded their ability to grip the road; this could reduce the operator’s ability to control the vehicle potentially resulting in a loss of vehicle control, vehicle rollover, personal injury and death. If your AdvanceTrac® system activates, SLOW DOWN. The AdvanceTrac® system helps you keep control of your vehicle when on a slippery surface. The electronic stability control portion of the system helps avoid skids and lateral slides and the traction control system helps avoid drive wheel spin and loss of traction. See the Traction Control chapter for details on traction control system operation. A Vehicle without AdvanceTrac® skidding off its intended route. B Vehicle with AdvanceTrac® maintaining control on a slippery surface. The system automatically activates when you start your engine. The electronic stability control portion of the system is disabled when the transmission is in position R or, on some models, if the stability control button is pressed and held for more than five seconds when the brakes are applied and the vehicle is at a stop. You can turn off the traction control portion of the system independently. See the Traction Control chapter. : Sport mode is not intended to be used on public roadways. Some models may also come equipped with a sport mode which allows the driver to reduce normal AdvanceTrac® system intervention and provide a more spirited driving experience. To enter sport mode, press the stability control button twice rapidly with the brakes applied. The message appears in the information display that the system is now in sport mode.